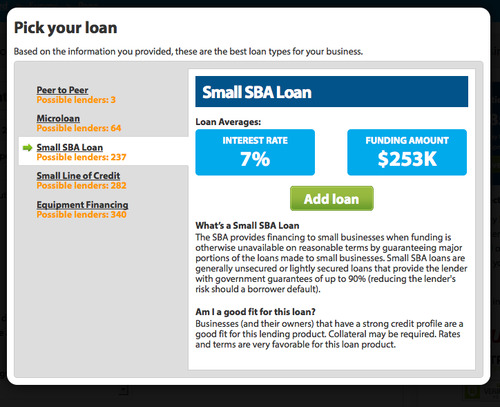 WHAT: Matches small business owners (SBOs) with the loans/lenders that best fit their profile. Lendio works with over 3,000 banks and credit unions nationwide. WHY: The small-business lending market is inefficient: approval rates are typically around 10% and a loan can take months. Also, SBOs generally don’t know the range of loan products available and often don’t look beyond their local banks, which may not offer the type of loan they need. Lendio’s approval rate is 50% to 70%. BACKSTORY: Lendio spent its first five years as FundingUniverse.com, which connected entrepreneurs to angels -- but 95% of applicants were small businesses, which angels typically avoid. When he couldn’t meet payroll, Brock pivoted the company to focus on small-business lending. WHEN/WHERE: April / South Jordan (near Salt Lake City), Utah. BUSINESS MODEL: Lenders pay for leads. Freemium for SBOs, which get all their loan matches and access to additional support and (not free) products when they subscribe, currently $29.95/month for the basic plan, $299/month for premium. [ Brock says they are still testing price points. ] Products include customized business plans, slideshows and websites. COMPETITION: Established players like On Deck Capital, Biz2Credit and iBank. CUSTOMERS/GROWTH: Over 10,000 business owners have signed up and requested about $1 billion in business funding. Brock says the average loan is about $35K to $45K; Florida and Texas are hotspots for small-business lending. Steve Strauss (@stevestrauss), small business columnist for USA Today, tells LAUNCH that for an SBO, getting professional help can increase the odds of getting a loan. “I don’t know anyone who’s doing what they’re doing. That’s a unique service and fits a market need,” Steve says. The first step: tell Lendio about your company, everything from how much money you’re looking for to your total business debt to the amount of cash you currently have in the bank and the kind of accounting software you use. Next, see what kinds of loans fit your current business situation and how many potential matches you have in each loan category. Lendio highlights the average interest rate and loan amount and explains the loan type. Once you pick a loan category, such as SBA, answer questions relevant to qualifying for that type of loan. 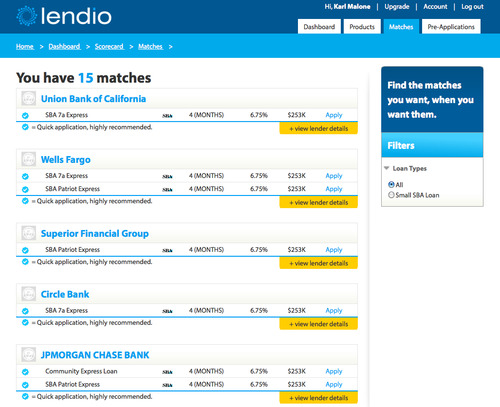 Finally, see your loan matches and decide which ones you want to apply to. A lender’s details page lists all its products and rates as well as gives you latest headlines and tweets about the bank.